I believe the inhabitants of London are under the impression that Letters posted for delivery within the metropolitan district commonly reach their destination within, at the outside, three hours of the time of postage. I myself, however, have constantly suffered with irregularities in the delivery of letters, and I have now got two instances of neglect which I should really like to have cleared up. Over night by eight o'clock, for the first delivery. Morning by eight o'clock, for the second delivery. Morning by ten o'clock, for the third delivery. Morning by twelve o'clock, for the fourth delivery. Afternoon by two o'clock, for the fifth delivery. Afternoon by four o'clock, for the sixth delivery. Morning by twelve o'clock, for the third delivery. Afternoon by two o'clock, for the fourth delivery. London is divided into 8 postal districts, in which the number of deliveries varies from 12 to 6 daily, between 7.30 a.m. and 7.45 p.m. The correct initials of the postal district in addition to the address will ensure the early delivery of a letter. E.C. Eastern Central. St. Martin's-le-Grand. W.C. Western Central. 126, Holborn and Charing Cross. W. Western. 3, Vere-street, Oxford-street. NW. North Western. 28, Eversholt-st., Camden-Town. SW. South Western. 8, Buckingham-gate, Pimlico. SE. South Eastern. 9, Blackman-street, Borough. N. Northern. 46, Essex-road, Islington. Take care to post before ¼ to 8, 10, 12, and 2, 4, 6, 8, in one of the Iron Pillar Boxes (first erected 1855) on the kerb stones of the leading thoroughfares. Letters posted at the Receiving-houses in London before 6 at night are delivered the same evening at all places within a circle of three miles from the General Post Office; or if posted before 5, they are delivered in the environs the same evening. There is no postal delivery in London on Sundays. Letters for the night mails out of London must be posted before 5.30 p.m., in pillar boxes and branch offices; at the General Post Office they are received without extra payment as late as 6 p.m.: from 6 to 7 with an extra 1d. stamp; up to 7.15 with an extra 2d. in stamps, up to 7.30 with an extra 3d. in stamps, and up to 7.45 with an extra 6d. in stamps. Letters for the day mails must be posted before 3 am. Post-cards, ½d. for the United Kingdom, and id for abroad, are a very useful means of correspondence. The rates for postage are 1d. for 1 oz. and under; 1½d. over 1 oz. and under 2 oz., and increasing proportionately ½d. for every 2 oz. or part of 2 oz. up to 12 oz. Newspapers and book-post packets must be left open at the ends. Postage ½d. for every 2 oz. or part of 2 oz. Parcels if not exceeding 1 ft. 6 in. x 9 in. x 6 in. may be sent by post at fixed rates. 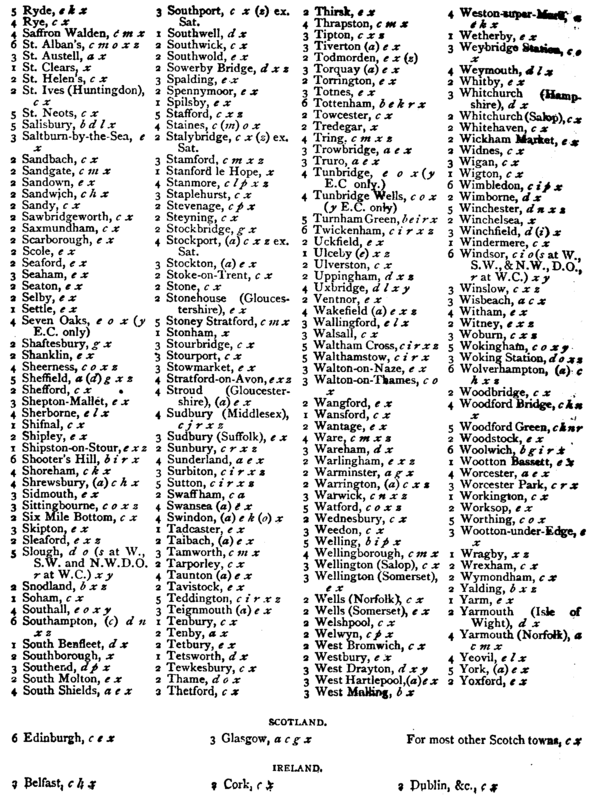 The following firms deliver parcels in London and the suburbs ; they have numerous fixed houses of call in the several districts. London Parcels Delivery Co., Sutton & Co., Carter Paterson, &c. The Globe Parcels Express forwards parcels to all parts of the world, and the Continental Parcels Express to all parts of Europe. Post-Office Money-Orders for sums not exceeding 10l., are issued at the several offices at the following rates -For any sum under 10s. - 2d. ; over 10s. and under 1l. - 3d. ; and increasing 1d. for every 1l. additional up to 10l. From this source alone the revenue receives more than 200,000l. yearly. A Postal Official Circular, containing a statement of the arrival and departure of packet-boats, of unclaimed letters, &c., is published every morning, under the authority of the Post-Master-General. By the addition of the initials of the Postal District to the address of a letter for London or its neighbourhood the work of the Post-office is facilitated. TOWN DELIVERIES—The portion of each district within about 3 miles of the General Post Office is designated the town delivery, and the remainder the suburban delivery. Within the limits of the Eastern Central District there are daily twelve, and within the town limits of the other districts eleven deliveries :—The first, including all Inland, Colonial, and Foreign letters arriving in sufficient time, begins about 7.20 a.m., and, except on Mondays, or on other days when there are large arrivals of letters from abroad, is generally completed, throughout London, by 9 o’clock. In the E.C. district the second delivery begins at about 8.30 a.m., and includes the correspondence received by night mail from Ireland and by the north mails arriving at 6.40 and 8 a.m.; and the third delivery in this district, corresponding with the second delivery in other districts is made at about 10 a.m., and includes the letters collected in London generally at 8.45 a.m and the correspondence by the Scotch mail arriving about 9 a.m. The next nine deliveries are made in every district hourly, and include all letters reaching the General Post Office or the district offices in time for each despatch. The last delivery, extending to all the districts, begins at about 7.45 p.m.
Each delivery within the town limits occupies about an hour. The provincial day mails are due at various times, and letters arc included in the next delivery after their arrival. The day mails from Ireland, France, and the Continent generally and the letters received from Brighton and other towns which have a late afternoon communication with London, are delivered the same evening in London and in the suburbs within the six-mile circle. To the SUBURBAN DISTRICTS there are six despatches daily. The first (at 6.30 am.) is to all places within the London district, and includes the correspondence by the night mails from the provinces, and by any colonial or foreign mails arriving in sufficient time. This delivery is generally completed in the nearer suburbs by 9 a.m., and at the more distant between 9 and 10 a.m. The second despatch (9.30 am.) is to the nearer suburban districts only. The third despatch (11.30 a.m.) comprises, with a few exceptions, every part of the London district. Except to isolated places, the fourth despatch (2.30 pm.) is to most of the suburban districts. The fifth despatch (4.30 p.m.) extends to the whole of the suburban districts; and, except in the remoter rural places, the letters are delivered the same evening. The sixth despatch is at 7 p.m. Letters for this despatch, posted at the, town receiving- houses and pillar boxes by 6 p.m. or at the chief office of the district to which they are addressed by 7.30 p.m., are delivered the same evening, except at a few distant places, where the delivery is made early the following morning. The deliveries in the suburban districts begin from one to two hours after the stated time of despatch, according to the distance from London, the deliveries in rural parts of the remoter suburban districts being necessarily fewer than in the towns and villages. The latest times for posting letters at the chief and district offices, and at the receiving-houses and pillar letter boxes, for the London and suburban despatches, and for the inland, colonial, and foreign mails are given on p. 207.
Letters brought to the receiving-houses after the fixed time of posting has expired cannot be forwarded till the next despatch, and the receivers and letter carriers are strictly forbidden to receive a fee for including such letters in the collection. Provided, however, that they be not detained, and their duty thereby impeded, letter-carriers in the suburban districts are permitted to take charge of letters to be posted on their route. As a general rule the number of despatches from any place is the same as the number of deliveries there. At the district offices, and at the town receiving-houses, separate boxes are provided for “London District’ and “General Post” letters; the inscription on the “London District” box being in red letters, and that on the “General Post” box in black letters. In the town districts generally, and in certain suburbs where there is a collection from the pillar boxes at 3 or 4 am., the receiving-office letter boxes are closed during the night and on Sundays, in order that letters may not be posted there, but in the pillar boxes, and so have the advantage of such early collection. The NIGHT MAILS FROM LONDON leave the G. P. 0. at 8 p.m., and (with one or two exceptions) arrive at all important towns in England and Wales in time for a morning delivery, beginning before 9 o’clock. The arrival at Edinburgh, Glasgow, and Dublin is also in time for a similar delivery. For the night mails, the latest time for registering both inland and foreign and colonial letters at the chief office, St. Martin’s-le-Grand, and at the head district offices at Lombard-street, Gracechurch-st, Mark-lane, Ludgate-circus, and Charing-cross, on payment of the ordinary fee of 2d, is 5.30 p.m.; or on payment of a late fee of 4d. in addition to the registration fee, the latest time is 6p.m. ; and at the chief office only, between 6 and 6.30 p.m. on payment of a late fee of 1s. ; between 6.30 and 7.30 p.m. for foreign mails; and between 6.30 and 7.45 p.m. for inland mails, on payment of a late fee of 2s. 6d. in addition to the ordinary fee and postage. At the town branch offices and town receiving-houses the latest time for registering letters for the night mails (such letters not being forwarded by the midnight despatches) is 5 p.m.
For the day mails to the Provinces, Ireland, Scotland, France and the Continent generally, and for the colonial and foreign mails via Southampton, letters can be registered at the chief office, at the head district offices, and at the Lombard-street, Gracechurch-street, Mark-lane, Ludgate-circus, and Charing-cross post-offices, for the ordinary fee, between 6 and 7.30 p.m., and at the town branch offices and town recieving-houses between 5.30 and 7.30 p.m. the previous evening; and for the other day mails to the provinces half an hour before the latest time for posting ordinary letters. For the first London district delivery letters can be registered at the chief office, at the head district offices, and at the Lombard-street, Gracechurch-st, Mark-lane, Ludgate-circus, and Charing-cross post-offices for the ordinary fee between 6 and 7.30 p.m., and at the town receiving-houses between 5.30 and 7.30 p.m. the previous evening; and for the other London district deliveries half an hour before the latest time for posting ordinary letters. No letter can be registered at the chief office, the Lombard-street post-office, or the Western District office before 7.30 a.m. or after 7.30 p.m. or at the Charing-cross, Gracechurch-street, Mark-lane, and Ludgatecircus post-offices, or other district offices, before 8 a.m. or after 7.30 p.m., or at the town branch offices and town receiving-houses before 8 am., between 5 and 5.30 p.m., or after 7.30 p.m. At the suburban offices the latest time for registering is half an hour before the fixed time for clearing the box for each despatch, except that no letter can be registered before 8 a.m. or after 7.30 p.m.
POSTE RESTANTE.—There is a Poste Restante both at the General Post-office, St. Martin’s-le-Grand, and at the Charing-cross post-office, where letters “to be called for” can be obtained between the hours of 9a.m. and 5 p.m. There is also a Poste Restante at Woolwich, available during the ordinary hours of business. No letters (except communications from the Savings’ Bank Department) are taken in “to be called for” at the other district or branch offices, and any so directed are sent to the Returned Letter-office to be returned to the writers. The Poste Restante being intended solely for the accommodation of strangers and travellers who have no permanent abode in London, letters for residents must not be addressed to the post-office “to be called for;” and any letter for a resident so addressed, although delivered at the post-office for one week, are, after that time, sent out by the letter-carriers. Even strangers are not, as a rule, allowed to use the Poste Restante for more than two months at the end of which time they are expected to have their letters sent to a private address. Letters addressed to initials or to fictitious names at the Poste Restante are not taken in. Letters may not be re-directed from a private address to the Poste Restante. Letters to be called for at the General Post-office should have the words “to be called for” added to the address; otherwise such letters are sent round, in the first instance, to the several departments of the General Post-office to ascertain whether they are intended for any of the officers, and therefore may not be at hand when applied for. All persons applying for letters at the Poste Restante must be prepared to give the necessary particulars to the clerk on duty. 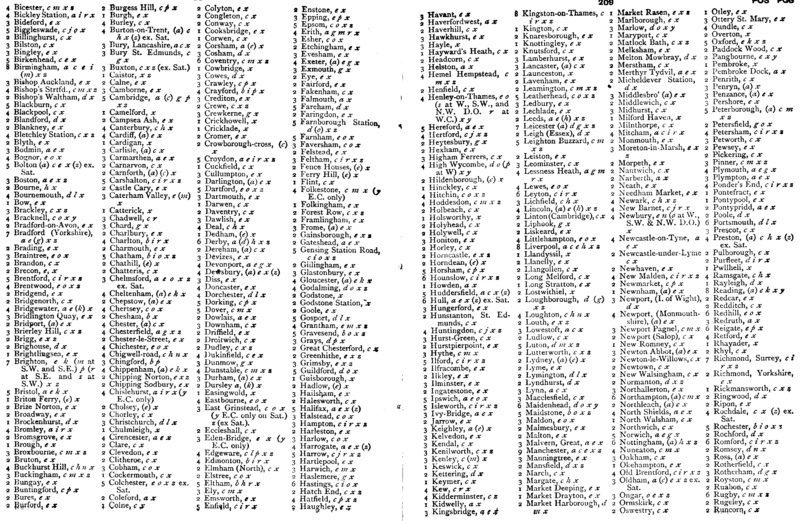 If the letters be for a subject of the United Kingdom, he must be able to state from what place or district he expects them, and must produce some proof of identification; and if he sends for his letters, the messenger, besides being furnished with this information, must have a written authority to receive them. If the applicant be a foreigner, he must produce his passport; or if he sends for his letters the messenger must produce it. Subjects, however, of states not issuing passports, are treated as subjects of the United Kingdom. Letters from abroad addressed to the Poste Restante, London, are retained for two months, letters from provincial towns similarly addressed are retained one month; and letters posted in London one fortnight. All such letters, at the end of these periods, being sent to the Returned Letter-office for disposal in the usual manner. None of the letter receivers (commonly known as “postmasters “) in the London district are required to take charge of letters to be called for ; and all newly appointed letter receivers are forbidden to do so. Those who have been for some time in the service are for the present permitted to take in such letters (charging a fee for the accommodation), provided that the letters are addressed “Post-office,” and that the persons seeking such accommodation are known to them or have previously made a like application, and that the receiver is satisfied that proper use will be made of the privilege. When, however, letters for strangers are presented without the receiver’s consent having been first obtained, or, when there is reason to suspect that the receiving-house is being made to serve improper ends, the receiver is instructed to refuse to take them in. Letters may not be redirected from the Poste Restante to a receiving-house, or from one receiving-house to another in the London district. This regulation does not apply to communications from the Savings Bank Department addressed to receiving-houses to be called for; letter receivers being required to take in such communications, but without requiring any payment from the depositors. Private letter boxes may be rented at the window of the General Post-office, at the Lombard-street, Gracechurch-street and Mark-lane branch offices, and at any district office. The charge for a private box is £3 a year payable in advance; and no box can be rented for less than a year. Private box holders can obtain their letters between 7.30 a.m. and 7.45 p.m. Overcharges are returned between the hours of 10 and 4, on presenting the overcharged letters at the office for the sale of stamps, &c., at the General Post-office. Or the letter maybe sent to the office by the letter-carrier of the district. The following telegraph office are open continuously during the day and night, both on week days and Sundays: Central Telegraph Station, St. Martin’s- le-Grand. Paddington Station (Gt. Western Railway Co.’s office); St. Pancras (Midland Railway); Victoria Station (London, Chatham & Dover Railway); West Strand. The following head district offices are open on Sundays from 8 a.m. to 8 p.m.: Eastern District office, Commercial-road; Euston-square Station; Northern District office, Islington; Southeastern District office, Borough; South-western District office; Buckingham-gate; Western District office, Vere-street; Western Central District office, Holborn. All post-offices in the London district are closed on Sundays, with the exception of the following which are open for the receipt and despatch of telegrams between the undermentioned hours: Blackwall Railway-station, B.O., 8 a.m. to 8 p.m.; Bow, North London Railway-station, 7 a.m. to 11 p.m.; 297, Camberwell New-road, 8 a.m. to 8 p.m.; Camden-road, B.O., North London Railway, 7 a.m. to 11 p.m.; Chalk Farm, North London Railway-station, 7.30 a.m. to 11 p.m.; Clapham-common, 8a.m. to 6p.m. ; Crystal Palace (western entrance), 8 a.m. to 8 p.m.; Dalston, North London Railway. 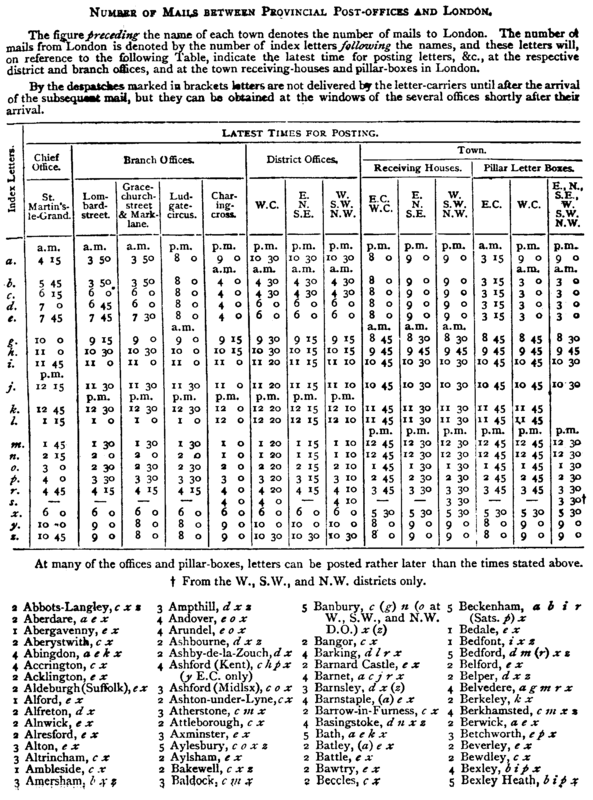 station, 8 a.m. to 11 p.m. ; Greenwich B 0 Nelson-street, 8 a.m. to 8 p.m.; Hammersmith, Broadway, 8 a.m. to 8 p.m.; Kensington, Addison-road railway-station, 8 am. to 8 p.m.; Paddington, London-st, 8 a.m. to 8 p.m.; Putney, near railway station, 8 a.m. to 8 p.m.; Circus-road, St. John’s Wood, 8 am. to 8 p.m.; South Kensington, Exhibition-road, 8 a.m. to 8 p.m.; Waterloo railway-station, 8 a.m. to 11 p.m.; Woolwich Arsenal, 8 to 10 a.m.; 5 to 9 p.m. Letters, however posted in London and sub-districts between the hours of 7 and 9 p.m. on Saturday, are forwarded to the travelling post-offics, and reach their several destinations in time for delivery on Monday morning. Letters posted in the pillar-boxes within the town limits, and in some of the nearer suburbs, on Sundays, are collected early on Monday morning in time for the general day mails, and for the first London district delivery.